Another Butter London polish for you today, I actually thought I'd posted about this at Christmas but it appears not. This is quite similar to the Barry M Red Glitter polish that I posted about a while back - link here - but this has better lasting power and is a little glossier, it's also a bit deeper in colour and has more of a berry shade to it. Application wise, I apply this over one coat of a red base, normally Rimmel's Celebrity Bash which is a deep crimson shade. It's a really lovely polish and great for an event or a night out or if you just feel like cheering yourself up on a grey and rainy day! 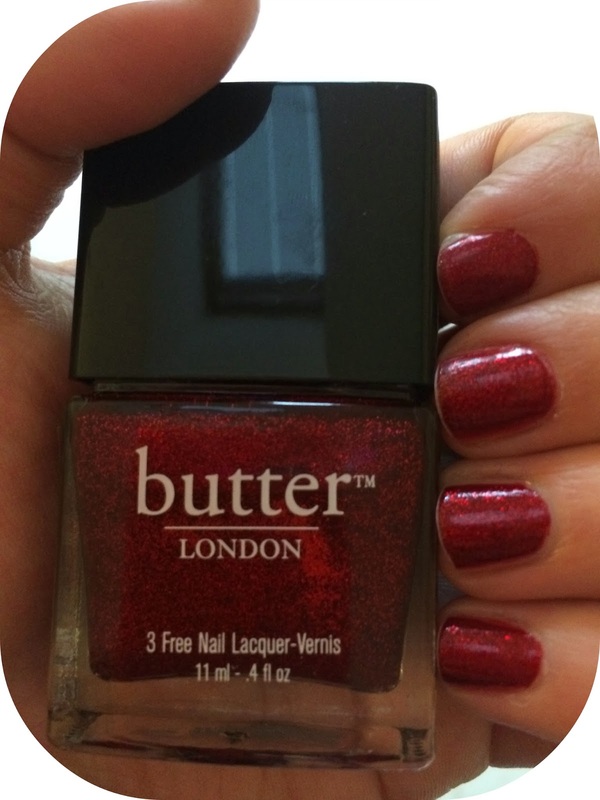 You can pick up Butter London polishes at Boots for £12. 3 comments on "NOTD // Butter London Chancer"
I love this colour combination, it's really pretty! I'm a bit fussy over red shades but I'd definitely wear this one.